But they’re like the ninjas of cleaner-uppers. You drop something and they seemingly spontaneously grow from the ground, sweep up your popcorn or whatever, and disappear. And it’s practically instantaneous. I’d time it, but it would be pretty rude to drop something on the ground and wait around just to see how long it takes custodial to get rid of it. And I am not that rude. Trust me though. They’re fast. The park is immaculate. I love it. Whenever I go to the county fair I feel like I’m knee-deep in trash compared to Disneyland. I had heard other people report this but had never seen it before, so I was very pleased to catch it in person. I also happened to meet up with a blog reader, Jeri, and her bachelorette party about 2 minutes before that moment and when I was like WAIT I HAVE TO TAKE PICTURES OF THIS HERE WATCH THEO IN HIS STROLLER and went over to take some shots, they seemed a bit puzzled by my behavior. But they were all really nice about it and made sure Theo didn’t accidentally roll down Main Street while I snapped a few pictures. 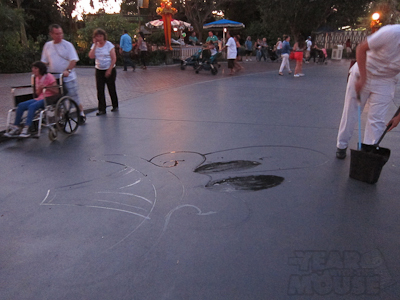 The custodial cast member drew his Donald like he was picking up popcorn, like this was something he does every day. Which actually it probably is. He simply walked away when he was done. Within a minute or so it started to disappear. It was super cool, being in the right place at the right time, for the right little bit of Disney magic. And then the bachelorette party and I went over and rode on Buzz Lightyear, where Theo managed to score nearly 5,000 points by waving his blaster around and randomly pulling the trigger. He then declared the ride to be “scary” despite the fact that this is probably his 10th time on it. But it was okay because the bachelorette party went off to ride something truly scary, Space Mountain, and he and I went home. 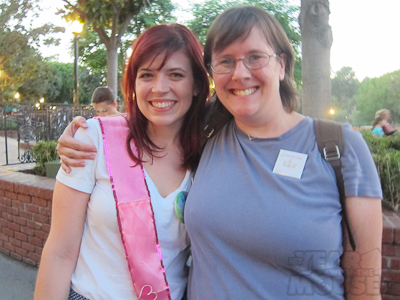 And congratulations to blog reader Jeri on her upcoming nuptials! She’s getting married on November 23rd, the day before the best day of the year to get married (which would be my own anniversary, the 24th). Help me wish Jeri a Happily Ever After! And also Theo’s new favorite babysitters. See? Wouldn’t you trust these women with your child? Of course you would. Congratulations and best wishes, Jeri! And I think Theo more than doubled my score on that ride. How embarrassing. 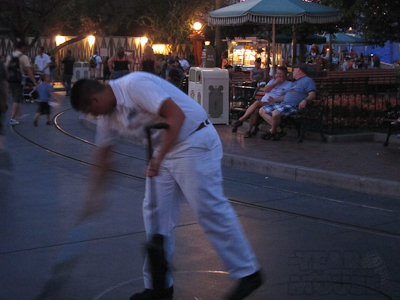 Regarding custodial at Disneyland I have to completely agree that they do an OUTSTANDING job. We were at Disneyland Paris a year ago and the place was filthy! I was so upset. There were weeds everywhere. Not just 1 inch weeds, but 4 foot weeds. I’m not kidding. The bathrooms were all filthy. I know that even at Disneyland a restroom can have troubles, but at Disneyland Paris they were all filthy. To defend Disney they are a minority shareholder in Disneyland Paris and I’ve heard that Disney is considering purchasing a majority position. 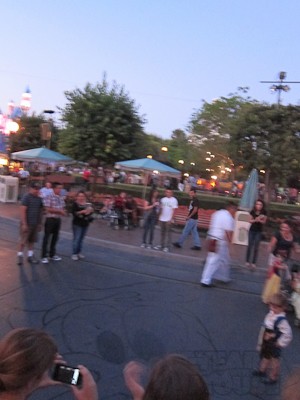 To come back to your posting, I’ve always been so happy with how clean Disneyland is. 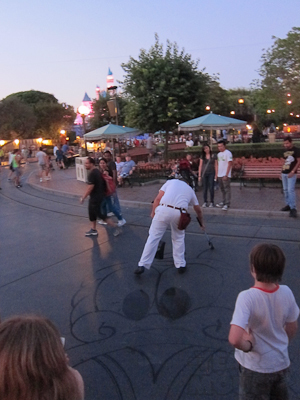 I heard that the custodial staff get more questions than any other Cast Members at Disneyland, so they are expected to know all sorts of things. We’ll be there in November to get married! Not through Disney (I wish) but spend time there before and after. Custodians drawing with water! This about sums up why I love Disneyland so much! Congratulations, Jeri!!! 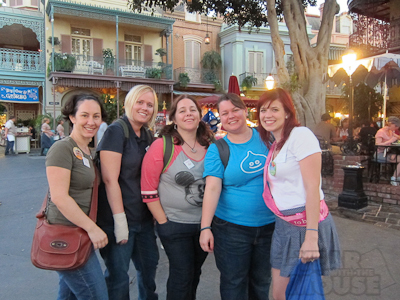 What an awesome Bachelorette Party! It was a fabulous time. Way better than that other place people go to celebrate these types of things! 🙂 Thank you! That is so cool! I’ve never heard of the water drawings before! The custodians really are awesome. My mom dropped her glasses in the duck pond near Big Thunder Mountain Railroad and a guy came and very pleasantly fished them out for her! I’ve seen them drawing several times in the mid morning at DCA. I’ve never seen it at DL before though. Congratulations to the new bride! Thank you for meeting up with us! It was such a nice time, and readers beware Theo is even more adorable in person! It was so nice to meet you, Shelby and Theo, and thank you all for the congratulations! I would love to see the water drawing! How fun! (And Push the talking garbage can…my dream). There is a Six Flags near us up here in Nor Cal, and I always notice the railings that need sanding and painting and bathrooms need serious cleaning, and think to myself that Walt would not stand for that at all.